The commodity sector, as a whole, closed out its first positive year in 2016 since 2012. 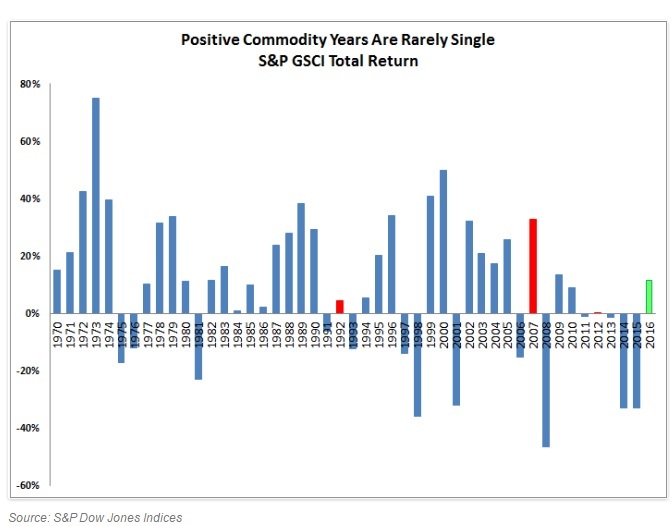 The good news for hard assets, including precious metals, is that positive years in commodities usually come in bunches. Gazing into the crystal ball for 2017: Jodie Gunzberg, global head of commodities and real assets at S&P Dow Jones Indices, finds that the path upward could continue into 2017 and beyond. She points to three key factors that could impact the commodity sector as a whole this year: inflation, a potentially weakening dollar and OPEC. Let's take a look at each factor. Historically Republican presidencies are favorable for grains and gas which are key for rising inflation, Gunzberg says. "Copper, lead and nickel have had their best performance with Republicans. That in itself does not promise growth since rising inflation from commodity prices can cause stagflation – but stagflation is less likely if Trump builds infrastructure and jobs growth which may propel GDP and help the metals. "Also, industrial metals outperformed precious metals last month by the most in 26 years. This is considered extremely bullish," Gunzberg says. The US dollar has been on a tear –rising significantly in recent weeks, which in turn has pressured commodities including gold and silver. Precious metals are priced and sold in US dollars on the world marketplace and a rising dollar tends to depress the price of these and other commodities, as it makes them more expensive to foreign buyers. Although the dollar theoretically should rally from rising interest rates, that relationship hasn’t held, Gunzberg says. "So, even if rates rise more, there is a chance the dollar will revert after continually hitting new recent highs – that can lift commodities substantially. In fact, every single one of the 24 commodities we track rises from a falling dollar, especially industrial metals which can rise as much as 7% for every 1% the dollar falls." Crude oil prices are on an upward path. Since bottoming at around $26 per barrel in February 2016, crude oil climbed as high as $55 per barrel at the start of 2017. Perhaps you've noticed higher gasoline prices at the pump? Get used to it. A significant impact of rising crude oil is higher inflation throughout the economy. Higher crude prices not only impact pump prices, but almost every good you buy from milk at the grocery store to that sweater at your favorite department store. Why? Higher crude oil prices mean higher transportation costs for all goods in the economy, which usually are passed along to consumers. Whether all the participants follow through on the agreement. How the U.S. producers respond. These two sectors had their best years since 2007 and 2009, respectively Gunzberg says. "The comeback in these two sectors is meaningful because they are the most economically sensitive, and the last time these two sectors were up this time together, they led commodities to return nearly 360% in the next eight years (1999-2007)." Despite the sell-off in precious metals in the second half of 2016 –gold still closed out the year 2016 with an 8.5% gain. Recent action: Since bottoming out at $1,2430 in mid-December, gold has gained 5.47%. Gold prices are already starting to move higher. Is your portfolio properly diversified? Many investors are using the recent strength in stocks to book profits on the equity portion of their portfolios and use the proceeds to diversify into tangible assets. A Blanchard portfolio manager can help design an investment plan tailored to your personal goals. Call us at 1-800-880-4653.